Rebecca Rae Photography - About Rebecca RaeRebecca Rae in action on her wedding day! 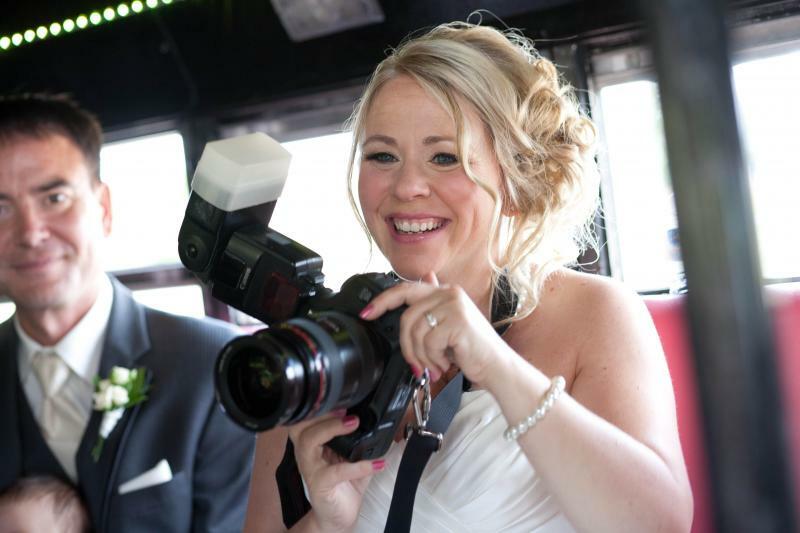 Rebecca Rae in action on her wedding day! I started doing photography as a young girl taking pictures any chance I could get. I began taking it seriously when I was a senior in high school and I decided I wanted to become a professional photographer and start my own business. I earned my Associate of Arts degree from North Hennepin, while taking many photography classes and working for the school newspaper as their photographer. I also had a love for children so my next step in life was to attend the College of St. Catherine's where I earned a degree in early childhood education and parenting education. After teaching for two years, I decided to focus on Photography as my main career. I moved to Santa Barbara, California where I attended Brooks Institute of Photography. Brooks Institute follows the philosophy of "learn by doing". Brooks is known for teaching students the artistic, technical, and business expertise needed for professional photography. While attending Brooks I learned from professional photographers many techniques to lighting people (learning what sort of light to use with every different face shape) and product (learning how to show texture and shape). We learned to work with all types of cameras (from 4x5 to 35mm), film and digital. While in California I was able to work with some award winning photographers. I was lucky enough to get an internship with Jeff Dunas who was a big inspiration to me. I assisted many other photographers as well doing weddings, work for Pottery Barn Magazine, and people photography. I have attended workshops with celebrity wedding photographer Anthony Vazquez and seen many other fabulous photographers speak which keeps me inspired! I started up my business in May of 2005. I have been doing weddings, newborns, families, children, maternity, seniors and product photography. I have done work for Barnes and Noble, Shecky's events, real estate and interior design companies, and pro boxing at the Target center. I have also done product photography for various businesses. I have been published in Minneapolis St. Paul magazine, Lavender magazine, and The Perfect Wedding Guide. I workd for First Day photo for 2 1/2 years photographing hundreds of newborns and family members. I am using my people skills, my creativity, my love for children, along with my expertise in lighting to create the pictures you are looking for. I love being behind the camera and enjoy every moment of it, no matter what I am photographing. The most exciting thing for me is to see a picture and love it, but even more important is to know that you will love it too. Thank you and looking forward to photographing you soon!